It’s snowing in New York – perfect soup day! 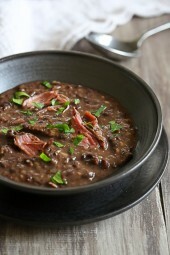 And black bean soup with smoked turkey is a hearty, filling, fiber-rich soup. The kind of soup that sticks to your bones on a cold day like today. More of my favorite pressure cooker or Instant Pot soup recipes are Cheeseburger Soup, Chickpea and Sweet Potato Stew, and Turkey Meatball with Ditalini Soup. 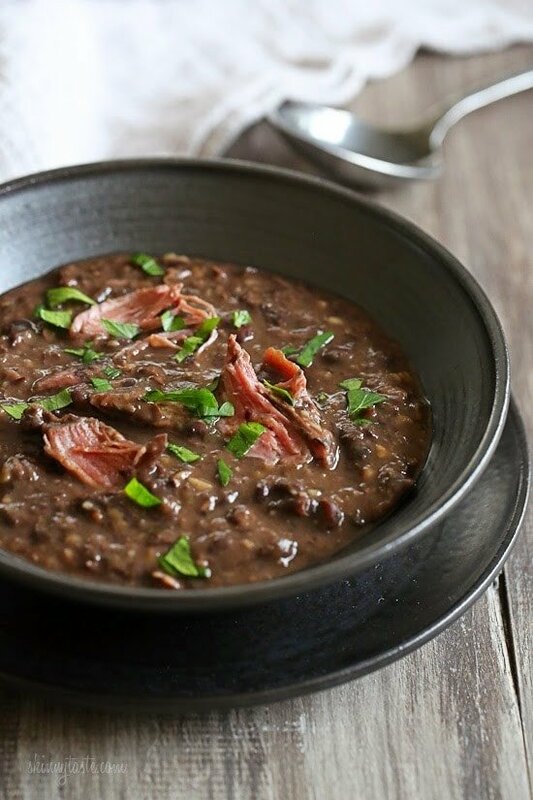 This is also inexpensive to make, I start with dried beans and I use my pressure cooker (my favorite pot to make beans) because it cuts the cooking time in half and the flavors really get into the soup. The smoked turkey leg adds wonderful flavor to the soup. If you can’t find smoked turkey legs, you can use smoked turkey sausage instead. You can also do this in a large pot or dutch oven, but keep in mind it will take twice as long to cook and you’ll have to add more liquid to the pot as it evaporates, where as in the pressure cooker you don’t get much evaporation. This is also great to freeze for the month, it thaws and reheats perfectly so you can make your own healthy freezer meals. I freeze them in portions and use a sharpie to write the name, date, and calories or points. 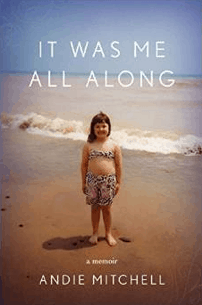 And speaking of snowy cold weather, I’ve been cozying up with Andie Mitchell’s new memoir, It Was Me All Along. I share this because I recently met her – and found her to be such an inspiring person, a really good soul. I know so many of you will really relate to her story, or at least get inspired. In her memoir she writes about how she went from 268 lbs at age 20, and lost half her weight. But it’s not just a story about her weight loss, it’s about hope, finding peace, making changes, and finding her freedom. A perfect read for 2015. 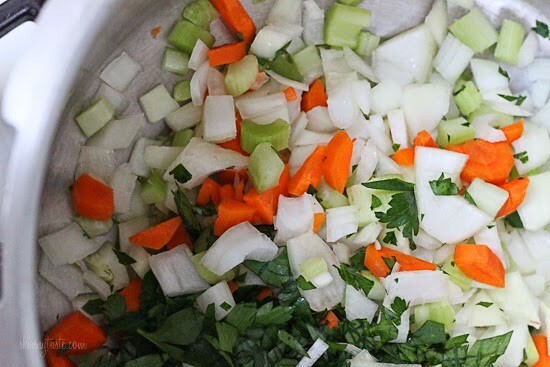 Place the olive oil and onions, carrots, celery and parsley in a 6 quart pressure cooker over medium high heat and cook until fragrant, about 8 to 10 minutes. Add water, bay leaves, beans, turkey leg, and black pepper and bring to boil. Cover and lock the lid on the pressure cooker. Place pressure cooker topper in place and bring to high pressure. Lower the heat to medium-low so pressure is maintained; cook beans for 45 minutes. Turn off heat and wait for the steam to release. Once steam is completely released, remove lid and set aside. Discard bay leaves and set turkey legs aside. Using an immersion or traditional blender, puree the beans leaving the soup chunky, or to your desired consistancy. If you use the immersion blender you can puree the beans right in the pressure cooker. 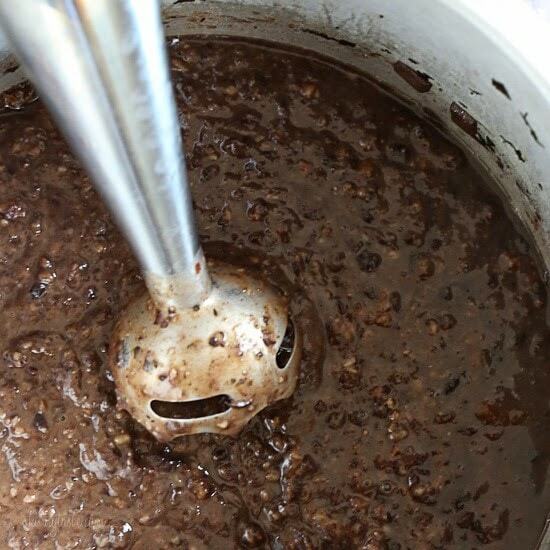 If you use a traditional blender, blend in batches and return the beans to the pot after beans are pureed. Add the salt and return the turkey to the soup. To serve, ladle soup into 8 bowls. *Calculated with 11 oz smoked turkey meat. This is the best soup I have ever made. I have probably made all of your soups and this is the best. I will make this often. Made this twice and it was perfect both times! I made this Saturday in my Instant Pot and it was delicious! I used the bean/chili button and set it to 45 minutes. I left it at natural release for 20 minutes then manual release for what was left. My husband had smoked a turkey in Nov. and all we had left in the freezer was white meat, so I used a large breast portion. Yes it was a bit dry but I knew it would be since white meat often is when re-cooked like that, but it was still wonderful. I left it whole so it would be easier to remove at the end, then took it out and shredded it. Shredding helped temper the dryness more than if I had cubed or diced it. I also took out some of the beans (about a cup – I didn’t measure) before using my immersion blender then added them back in when I was done. This recipe is definitely a keeper! I have leftover smoked turkey that my husband made but it’s cut up into slices. I was looking for a way to use it up but being already cut would make it harder to get out than a whole leg, before using the immersion blender. Any suggestions? Of course the one time I want smoked turkey legs grocery store is out. I used smoked pork shanks instead. It was really good, but I had to add chicken bouillon at the end because it was a little blame. I wish I could show you my 1yo daughters face. She loved the soup and looks like she has a beard!! so, I am really enjoying my instant pot. The time for this soup is the same amount in the instant pot as in a regular pressure cooker?? Are the cooking times the same when using an instant pot? High pressure or low pressure? I have to say I have been making black bean about every way possible for years and never really satisfied with my results. Decided this looked different with the smoked turkey and gave it a try. Absolutely delicious! Very nice recipe. Thank you for posting it! I made this in my instant pot. Followed the directions exactly, except I used the beans setting and set it to 45 minutes. I also couldn’t find a smoked turkey leg, so I used skinless smoked turkey sausage. I’m definitely making this again. Super fast if you use the mirepoix veggies from TJs! Thank you! What are the current points for this based on freestyle? I am new to all that so I am super confused ???? The SP have been updated to reflect the freestyle program. I made this last weekend and it is delicious. I’m looking forward to using the same concept with split peas and other legumes. Heaps of left-overs for lunches this week. Would the directions be the same for an instantpot??? Amanda – I used my 8 quart Instant Pot for this recipe and it was perfect. My only concern would be getting a whole smoked turkey leg into a 6 quart or smaller pot. In that instance you could simply ask your butcher to remove the “handle” end of the turkey leg since there is very little meat, if any, on it. They have electric saws for that purpose. Enjoy! So still 45 minutes? On High Pressure? I love this soup. I have been making one from “cooking Light” with smoked turkey and lentils which was a favorite but now this one is too. Love the ease for the pressure cooker and being able to cook dry beans so perfectly in such an easy way. I am lucky to have a farmers market nearby that smokes turkey products called Sensenig’s and their smoked turkey legs are wonderful. This soup has wonderful flavor and the calorie count is so good for such a rich tasting soup. Thank you for another winner. I just made this and it smells divine! But my soup is extremely watery. Like, I have blended the beans and there was no earthly way it could have been called chunky, because of so much liquid. Wonder what I did wrong? Can I used canned beans and what would the time difference be? should i cook the turkey first and then add the beans towards the end then blend? Very good and easy! Making this for the second time tonight in my IP. The first time I made it I added juice from a half of a lime right before serving. It added a nice addition to the flavor. I love your website Gina! I check out your website every week as I am making my grocery list. I am eating mine now, yummy. I would use broth or stock next time to add some flavor. I have the pressure cooker XL and used the bean/soup setting for 15 minutes-that was too long (I did soak beans overnight). Mine turned out a bit thinner. I used my left over turkey for your Turkey noodle soup and turkey pot pie as well this week! Thanks. I have an instant pot. Can you tell me how I would cook this recipe with that appliance? I am so confused (AND INTRIGUED) with this new toy! Thanks, Gina. My guess is to use the bean/chili button. I can’t wait to try this recipe! I do have a question though; do the dried beans need to be soaked prior to cooking in the pressure cooker? Based on your ingredient list and instructions, it doesn’t seem that they do? Anybody use this with the instant pot? I made it in my IP using the same times. The turkey leg was fall off the bone. I love tender meat but turkey legs have many of those long, thin bones. So now I am digging around to find them. Soup is good but I am a little nervous to give this to my 1 and 4 year olds. I am thinking maybe I should have reduced the cook time? How would you put this in the instant pot? What would the times be? Has anyone made it with an instant pot? Would you use the soup setting at 45 minutes?? I made this soup and it was amazing! I used two turkey legs and pressure cooker. Can’t wait to make it again. So, how long do you cook this in electric pressure cooker? Oh and high or low pressure? Can I do a quick release? I’ve made this twice in the 2 weeks that I’ve owned my pressure cooker, the second time at my 8 yr old son’s special request (I initially described it to him as “like refried beans as a soup”). It is so, so good. Thank you, Gina! You are welcome! Glad your son likes it! Also thanks for converting your recipes to WW SmartPoints! I've lost 34lbs, thanks in part to these awesome recipe!! Couldn't find smoked turkey legs so I'm using rotisserie 2 chicken leg and thigh quarters, skin off ( as much as I could remove) and I rubbed smoked paprika on them! Also a small blast of chipotle peppers in adobo sauce( 1/4 cup)– found them in a squeeze bottle! I made this last night in my Instant Pot electric pressure cooker. I couldn't find smoked turkey drumsticks, so here's what I did. I used 2 fresh raw drumsticks sprinkled them with salt and pepper, then marinated in 1 T of liquid smoke in a large ziplock bag for a couple of hours before starting the pressure cooker steps. It worked great – I just put them in the pot (raw and marinated) at the same point the recipe says to put in the smoked turkey legs. I also added 1 T of liquid smoke to the mixture with the other ingredients before cooking. It was really good, but I over-blended it and it was not quite chunky enough – really good flavor though! Thanks Gina! I purchased smoked turkey legs but discovered they are not cooked. Do you cook them ahead of time or put them in to be cooked along with the other ingredients? Smoked turkey legs are usually already cooked so just add them with the other ingredients. Smoked meats will have a pinkish hue. Those unfamiliar with smoked meats may think the meat is undercooked. Do you need a smoker for outdoor use? Yes, you are in the right place, we are best smoker distributor. We have a best quality smoker, which you can use easily, we have a kettle, where you can cook top class dishes. I made this today in the slow cooker. I read the recipe as 'one turkey leg' so I only used one as stated however I only got half of the 11 oz needed. Didn't matter really. This soup is delicious! We topped with tomatoes, avocados, and a touch f sour cream and crushed tortilla chips. Beware…turkey legs are full of tiny, sharp bones. Thanks Gina…so yummy and filling! 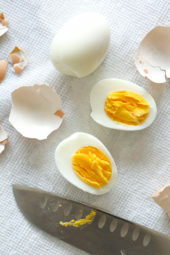 Can't wait to make this recipe, it looks delicious! Thank for sharing! I made this today on the stove top and it was delicious! The only additions I made were to switch cilantro for parsley, added a whole jalepeno to the pot while it was cooking (got blended up with the other ingredients) and topped with avocado chunks. It was such a warm and hearty soup and I cannot believe the turkey retained it's flavor after all that cooking. Thank you for sharing!! Hi Gina, I can't wait to make this recipe, it looks delicious! 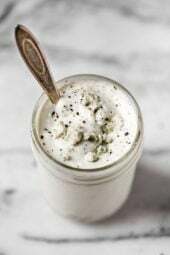 I wanted to know what kind of Immersion Blender do you have (brand/model)? Or if anyone could suggest one? Thank you. I know this is two years late, but I use a stainless steel Cuisinart immersion blender, but even lower cost ones work well. We made this soup yesterday, and are already planning a double batch to use this week! Thank you so much – it was easy and so very tasty! If I do it in the slow cooker, do I use the same quantity of liquid? My slow cooker would not hold as much liquid as the recipe called for. I only used about 10 cups total for a double batch. It did not evaporate during cooking. The soup looks to be the same consistency as Gina's. Made this today in the crockpot. I doubled the recipe and ended up with 20 cups at 3pp per cup or 6pp for 2 cups. It is fabulous. 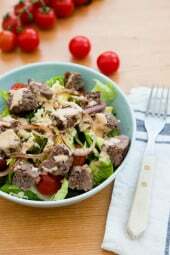 I will be freezing it for lunches and dinners and will definitely make this again! What kind of pressure cooker do you use? Is timing different for cooktop and electric models? i had the same question. The book store said YES. I have the Easy Pressure Cooker Cookbook by Diane Phillips. The book doesn't indicate which type of pressure cooker, so I just use it. Successfully! Also is that cilantro leaves sprinkled on top of the bean soup? A good book and some hearty home made soup is what you need in the Winter evenings, this all looks and sounds great! I was just curious why I no longer have the option to save recipes on your site to my recipe box? If you are trying to use ZipList it no longer exists. 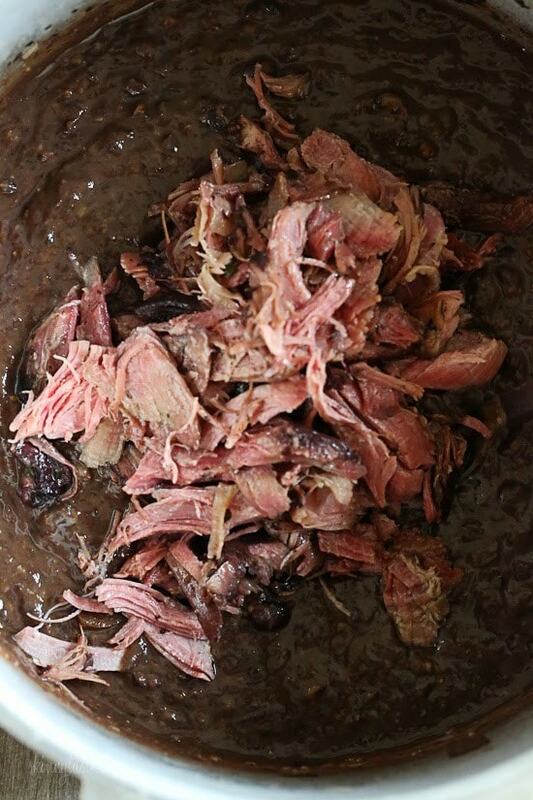 Do you think that you could use some browned ground turkey with liquid smoke to replace the smoked turkey leg? And how much would you use? I am thinking about 1/2 cup or 3/4 cup to keep the calories equivalent? Wow this sounds all kinds of comfy and delicious. I know my husband would love this dish. Thanks! Okay, I must confess I am scared of pressure cookers. Horror stories from way back when of them exploding! LOL! Do you use a stovetop one or an electric? My thoughts exactly. My aunt's has been in the basement for about 30 years and I never used it. lol She used it all the time. Don’t be afraid. The ones today are fine. Mine is electric. It’s the POWER COOKER XL. I got it st BJS. you can get it online. There are u tube videos about it. It’s great. You can can with it too. I made the black bean soup last nite in it. It’s fabulous!!!!! My mom says the same thing, I've been using it for years. I have a stove top presto. As long as you lock it and use it correctly, it's perfectly safe. I, also, am afraid of the stove-top pressure cooker. I'd loose the wiggle piece. I have an electric Cuisinart, I used it 3 times today. different meals. I love this lower fat version with smoked turkey. I have also made this with smoked turkey WINGS which are huge and have a lot of meat on them. Also for a more smoky and traditional taste this is great with smoked pork hocks. And yes, some cilantro and/or spicy chili powder or chipotle in adobo gives it a nice kick. I have 2 frozen left over turkey legs in my freezer from Christmas! I will try this and use my crock pot…don't have a pressure cooker but one is on my wish list!!!!! Looks really great. how can I take some pictures like yours? Looking forward to making this soup! Gina, where do you get a smoked turkey leg? Also, there is an electric pressure cooker called an Insta-Pot. This would be great in there. 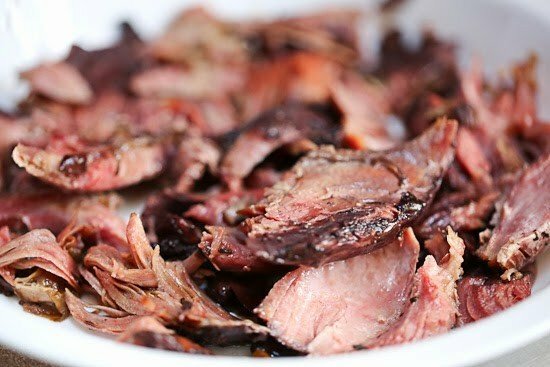 I just got my slow cooker for Christmas and made you balsamic pork today, because my daughter told me about your site! Not sure what to serve it with any suggestions? I had bought of bunch of ingredients to try to experiment with different slow cooker recipes, and I had bought regular turkey legs and black beans! Any idea how to add the smoke flavor without smoked turkey?I think cilantro would be good as well, don't you? What kind of pressure cooker do you use? I just got a pressure cooker today, can't wait to try it out with this! Have you tried this with any other type of bean? I love black beans and this sounds delicious, but my husband is allergic to them…only the black variety. Wondering how this might be with navy or pintos?? Thoughts?? I'm not a fan of black beans, but I love pinto beans, and I think they would be great in this recipe! I have done it with split-pea/with 3 turkey-leg's! Did you buy a smoked turkey leg? My Wegmans has whole smoked turkeys, but not parts. I'd love to be able to just get a leg for this, salads, or smaller meals. You could, but I wouldn't use a pressure cooker and it won't need to cook very long. I am just not sure how many canned beans you would need to equal dry but I am sure you can google that. What if I do not have a pressure cooker…can I make this in a crockpot and for how long? Yes, I would do it on high 6 to 8 hours, or until the beans are very soft. If using the crockpot, do I need to soak the beans overnight first? I would soak them yes! Beans in general are soaked overnight or 8-12 hours. This also decreases the compound in the beans that causes gas. Just to be sure you put it on HIGH in the crock pot for 6 – 8 hours vs Low? Also, do you need more liquid?